On Saturday evening at Annual Town Meeting, eight Articles prompted debates and/or amendments. All but one were Citizen Petitions. Only three of the debated Articles passed, all based on amendments. The Board of Selectmen asked voters to identify the last Saturday in March for the start of Town Meeting. The request was a result of officials’ struggles to be prepared in time to meet this year’s date. March 23rd was chosen because the bylaw change adopted last year referred to a “Town Meeting week” in March. In prior years, the meeting opened the first Monday in April – or later when pushed by a holiday. Some voters expressed concern over occasional overlaps with the last Saturday in March and Easter weekend or Passover. An amendment to the “2nd to last” Saturday was suggested. The final amendment agreed upon gives selectmen the ability to choose the last Saturday or move the meeting to an earlier week when necessary. It’s worth noting that even the revised schedule presents challenges to officials for 2021 and 2022. * So don’t be surprised to see more proposed changes come back to a future meeting. Resident Karen Hanlon’s Citizen Petition Article argued the Town’s Electioneering bylaw restricted residents’ free speech. She drafted the petition in response to an incident at Town Meeting last April. When another resident, Marnie Hoolahan, tried to collect signatures at the 2018 Annual Town Meeting, she was told that she had to stay 150 feet away from the doors. That was based on a bylaw change that Town Clerk Jim Hegarty successfully proposed to voters in 2017. On Saturday, Hegarty told voters that the bylaw he helped add to the Town Code as section § 41-22.1 was flawed and created an unintended problem. He agreed with Hanlon that it needed to be changed. Hegarty asserted that petitioners should have the right to do as they please immediately outside the building doors. But Hanlon’s version went further than repealing it. It added requirements regarding the ability of Article proponents to greet voters and placement of proponent’s materials. Hegarty was concerned those changes would interfere with safety, due to confined space at the hall and building entrances, setbacks and fire codes. He proposed an amendment to replace Hanlon’s language. all candidates or their agents are expressly forbidden to enter a building which is used as a polling place or Town Meeting for the purpose of electioneering or greeting citizens or voters, or petitioning or soliciting signatures for any purpose. Freddie Gillespie pointed out that language would prevent any resident running for office from attending Town Meeting, where they would naturally greet people they know. Others agreed that was a glaring issue. Selectman Dan Kolenda objected to removing the 150 ft boundary. He said it could lead to a future “gauntlet” of petitioners that cause issues with voters who want to enter without interference. Hegarty indicated stripping the 2017 bylaw would give him time to work on better language. So, again, don’t be surprised if this one comes back. The most hotly debated ATM Article on the blog this year has been the PILOT petition. So, it isn’t surprising that, though it was non-binding and the last piece of business after a long day, voters hashed this one out for a while. It took up the final hour of Town Meeting, keeping voters in the hall until after 11:20 pm. Petitioners Patricia Burns Fiore and Michael Weishan proposed a vote to pressure selectmen to negotiate annual PILOT (Payments in Lieu of Taxes) commitments from non-profits. The focus was on the big three: Fay School, St. Mark’s School, and NECC. With blog comments having raised concerns about churches and other non-profits, the petitioners amended the threshhold in the Article from non-profits owning more than $3M in property to $8M. Proponents said the schools have no downside in continuing to invest in land, especially houses for staff and students. Their actions take property off the tax roles and increase their use of Town resources. They argued that the schools should be making more reasonable contributions to offset that. They asked voters to pressure selectmen and schools to effect a change. The Article laid out a plan for pursuing removal of “Dover Amendment” protection for non-profits in Town if the schools didn’t make “fair” contributions. The amendment protects the schools from having to comply with Town zoning codes. A resident pointed out, that wouldn’t shield smaller non-profits from the impact of the 2nd provision in the Article. Fiore rebutted that, as stated in the Article, it would mean coming back to Town Meeting for voters to choose that option if necessary. if we continue to do this in the same way that we have done it for the 28 years that I have lived here, we’re going to get the same result. But opponents feared that adding a threat was taking the wrong approach. In a stated attempt to get something passed, resident Robert Reeder moved to strike the Dover Amendment paragraph. The vote on that was close enough to call for a headcount. (Always a lengthy endeavor.) In the end, the motion to amend passed 75-59. The amended version was approved by the majority of voters in the audience over the dissent of the majority selectmen and Advisory at the front table. *Next year the last Saturday in March is the last day of the month. But in 2021, Passover starting on March 27th could push Town Meeting back to the 20th – three days earlier in the month than this year. And in March 2022, there are no apparent religious conflicts, but the last Saturday is the 25th – not much better than this year’s schedule. Beth, with all due respect, you miss the point. No other town or city in the Commonwealth of Massachusetts regulates Town Meeting with a setback or restricts freedom of speech, i.e. the ability of citizens to handout voter information. That’s a violation of First Amendment rights. That’s why the Town Clerk withdrew. The citizens won that one by reversing the in place, wrong bylaw. Where we in the same meeting? A main purpose of Town Meeting is to have article sponsors have the ability to educate voters with voter information. You fail to mention that no other known municipalities have restrictions according to the State (Galvin’s office). Any restrictions are by state law for Election Day expressly, not Town Meeting. If the Town Clerk comes back with restrictions, which I don’t think he meant that, any resident could challenge that — because it is straight up illegal and wrong. This is why the “flawed” bylaw was dropped. If you would like to convince yourself, you might call Secretary Galvin’s office. Again, no other municipality puts in these restrictions at Town Meeting. Town Meeting is expressly for the Town’s people. Not BOS, not Advisory, not the Town Clerk. First amendment rights and freedom of speech rule. This is why no other town’s have these restrictions. And BTW, the spin that this is a contest between town officials and citizen presenters is not right, skewed, and distasteful. This is all about illegal versus legal, with a noteworthy look to see what other towns do in addressing policy failures and bylaw shortcomings. It is noticeable that you skipped right over the suggested policy changes on the prohibited conduct / anti-corruption / anti-fraud policy based on another town’s policy — and the fact that the BOS has a number of violations from the Attorney General’s office, with more pending. The very fact that the BOS has been releasing long overdue minutes, with some dating back to 2013, flies in the face of the Open Meeting Law Guide on the same matter. That guide states that minutes should be approved at the next meeting. It would be helpful if you reported on those violations and pending complaints as they are posted right on the AGO’s website. 1. I don’t think I missed the point. Perhaps I didn’t clarify it enough for your taste. I’m trying to distill 8 hours of Town Meeting into a few posts. I’m not going to capture all of the arguments that everyone individually thinks was the most important. I give you the opportunity to bring those up (as you have) in the comments. 3. I don’t even get your clearly angry take on my “distasteful” “spin”. You seem to have jumped to some kind of conclusion that I didn’t state or insinuate but you inferred. In later coverage, I will be referring to accusations that others made about the petitions being attacks on officials. But I haven’t gotten to the Articles in which those disputes occurred. I have covered the facts about disagreements that occurred with town boards opposing articles that were brought by petitioners. Was I not supposed to share them? Wouldn’t you then accuse me of covering up the obstructionism posed by town officials? Perhaps you are referring to something I wrote in a previous post? I referred to the fact that a big difference between successfully passed articles in the afternoon and less success in the second session seems to be the difference between being backed by Town boards vs just petitioners. I didn’t get into that yet. But perhaps you jumped to a conclusion about what that meant? Citizen petitions that are brought without board backing and at opposition of selectmen and Advisory positions start off in the hot seat. That means their odds for passing start off lower because they are guaranteed to be closely looked at and debated. I don’t know what “spin” has upset you. But, it’s not surprising since you consistently criticize that I misinterpret or mischaracterize something. So. . .
4. “with all due respect”, perhaps it is time for you to launch your own blog. I don’t mean that with anger. I quite frankly mean that you have a definite point of view on town politics and are clearly never satisfied with the way I cover it. You are free to start your own blog and share with residents your view of what’s happening in Town government. No other town or city in the Commonwealth of Massachusetts regulates Town Meeting with a setback or restricts freedom of speech, i.e. the ability of citizens to handout voter information. And it’s about illegal versus legal. No one does it, set restrictions. That says it all. The flawed bylaw was withdrawn by the Town. End of story. If that was “the” clear point, why was the original Article to re-write the rules vs simply stripping it out? If there had been an article to do that, the focus of debate would have been on the legality of the original law and comparing to other towns. But Ms. Hanlon’s article proposed to change the definition of what’s allowed and required at Town Meeting. That prompted a counter/alternate proposal by Mr. Hegarty with his version on the screen. Whatever you think the clear takeaway should have been, the debate in the hall became focused on the details of what a law should/shouldn’t allow. In the end, yes, most of the hall agreed that removing a “bad law” was better than debating on the floor what a replacement law should define or tabling revising it to a future meeting. Good question — which Town official, attorney or Town “editor” wrote the above for you? It sounds like it was copied right out of an email to you and not you. Be it that the case or not, the focus of all, including those parties, should be the fact that the error was owned up to by the Town / Town Clerk and the bylaw removed. As the presenter explained, no one else statewide has any restrictions like that, as known by the State. The article as proposed was one response to the illegal sense of the bylaw installed in April 2017. Another could have been to strip it out in its entirety. However, the process turned out to be a reasonable discussion and negotiation as evident on the floor that night. Bottom line is this: the April 2017 bylaw as presented by the Town Clerk and the Town was flawed and is now eliminated. However, what is the point of this entire discussion? The Town (Town Clerk) impeded the First Amendment rights of the Town citizens, inadvertently perhaps. What is the Town Clerk doing writing bylaws, one might ask? This one was a self-admitted goof up. The point of all of this is to make sure all voters are informed and stay so. That voters get information on all articles. That sponsors of articles have their information left out in the open and not shoved to the back of a table or dumped somewhere. These are basic freedom of speech rights. The outcome was a good one. It happened via the article as presented. 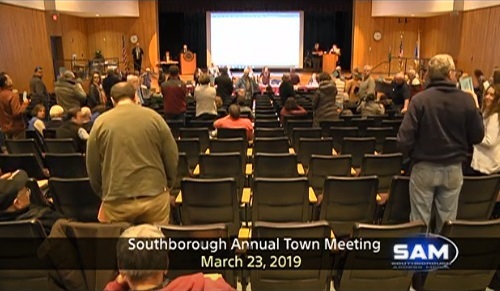 The presenter and the citizens of Southborough had their rights restored back to where they should be, and consistent with all other cities and towns. I know it’s hard for you to believe that someone could have an opinion that isn’t yours and not be in someone’s pocket – but I actually have a mind of my own. No one wrote my words. No one contributed to them. I haven’t been in communication with anyone about this. They were written in response to your previous comment and based on my observation of the meeting. Talk about rude comments. Thanks for your independent feedback. As for the above, none of it intended to be rude. It is a simple expression of frustration that you do not report on the wonderful and joyful fact that our residents had their first amendment rights restored — and those rights are now the same as all other towns and cities in the state. Where is that in your commentary? The traditional definition of a gentleman is a man who never gives offense unintentionally. Beth is not required by any principle to repeat your editorializing. I’m amazed she keeps publishing your comments on this thread. As it happens, I was in favor of the article. I even had a couple of paragraphs prepared to speak in support of it, so I was already at the mic when Mr. Hegarty proposed his amendment to the article, and I moved an amendment to his amendment (essentially putting Freddie Gillespie’s point in writing). I was pleased even after my/Freddie’s amendment to the amendment passed when Mr. Hegarty moved to strike his amendment. We won. The hall seemed to be happy with that, although not unanimously. Why is the substance never the focus, including your own comment starting point? There is a lack of focus on policy and the point. Let’s all focus on substance: first amendment articles were actually voted away in 2017. (I voted for it, mistakenly, based on what was described at the time.) I agree with you and the majority vote. It was a good thing for the voters to recognize (and also the town clerk) that their rights were gone and the bylaw stricken. You are right: the taxpayers won one. Thank you, Beth, for a comprehensive coverage of TM. My husband and I are “snowbirds” and spend the winter in Florida. However, your blog is a lifeline to the town we both love. My question is about attendance at this Saturday meeting. Were there more people there than at usual Monday night meetings? People always have an excuse for not attending, but one of the worse is “my child has a game that day”. Personally, if that parent was truly interested in attending the TM, he would do so. And I think those people who constantly critisize now you about how you report something are just plain rude!! You do a terrific job — you have a husband and family and this is a volunteer job for you. They come first. Thank you. As to your question – I haven’t found the time to put research into this yet. Certainly the afternoon session was fairly well attended – about 320 people. The Saturday night session would be more comparable to a Tuesday night than Monday. The Town Clerk answered at the meeting when asked that there is no average night. I don’t have the data yet to support that is accurate – but it seems to fit with my observations. I do think that the Saturday afternoon session was a success. I do wonder if the night numbers were lower than they would have been if it was continued to another day/night (or 6 months later) rather than tagged on to make it 8 hours worth of meetings in one day. So there are at least 5 or 6 very vocal posters on this blog who have distinct opinions on how the town should be run. We can guess the identity of some of them. But he time is now to step and run. Get the signatures and put yours positions in the marketplace of ideas. It is easy to criticize from the comfort of home on a blog. This is about service. Work, family and personal time sacrificed for public service for the common good. Ask yourself, if not now when ? if not me who ? You left out my favorite expression from the 60’s: You are either a part of the solution or a part of the problem. Never signed on to that philosophy either. I vote and pay taxes. If you wish to silence my voice talk to Beth or better yet change the US Constitution. Several presidential candidates are looking to change the legal voting age, pack the Supreme Court and eliminate the electoral college – might as well add amending the Bill of Rights. A certain political party has already been playing games with gerrymandering, not to mention impeding the right of people to vote – making it as difficult as possible (in a non-discriminatory way, of course …wink, wink, nudge, nudge). That same political party has already ‘packed’ the supreme court, which will, sadly, have repercussions for decades. As for elimination of the electoral college – please, bring it on! That archaic institution was created centuries ago because of the difficulties involved in counting the vote. Why we haven’t moved to electronic tabulation remains a mystery. And, puh-leez, don’t start about the Russians, etc. It could be accomplished electronically and securely. While we’re at it, let’s also fix the count for the House of Representatives. That’s a screwed up mess if ever there was one! Go for it. Everyone can do more. Everyone knows who you are based on your own comments. Serving on multiple committees and roles? No problem, right? Also, however, isn’t the above a bit off? The due date has gone by, right? You are correct, it’s too late to collect signatures to be on the ballot. Someone could wage a write-in campaign for an office. Obviously, that’s more challenging to win.